okay, so i know you guys don't want to hear me weep and cry over Jasmine, but i'm trying to get over it. Because i'm having such a hard time, i don't think i'm going to be online for a while. he seems to be the only thing i can think about much less talk about. So until i'm happy again, or well enough to act as if i'm happy i'll be away. So as i've heard.. Jasmine was cremated in one of his Hizaki Grace Project costumes..
it was said that he listened to Hizaki Grace Project endlessly before he passed..
also one of his last wishes was to see the night sky in Yokohama..
i don't know any more than that..
i just can't get him off of my mind..
it's been over three weeks now and i'm falling into a deep depression.. I'm not over Jasmine.. it's been over a week... I just can't stop thinking about him. He's my everything right now..
and i never even liked him so much..
i've always loved him, i can't help but love him..
but he was nothing near what i loved..
and grew to love him more and more..
and then it was pure love..
still not as much as others, but i couldn't help but love him. and it was little by little, as i said..
i remember when i disliked him so much..
and the first thing i ever heard him say made me laugh and i knew he couldn't be that bad..
:) it was what made me first trigger my love for him. he said, "i hate blue cheese! it makes me feel like an animal in the zoo." and from then on, i tried to love him..
and that i just loved him because i loved so many others but him..
which i ended up accomplishing..
i watched him from here to there.. usually with the band though..
i listened to it everyday..
i watched it very often..
and i've begged for more of them..
it was my favourite by them. 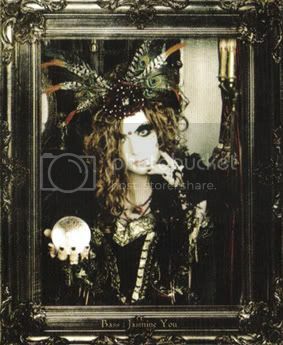 and i still love it..
but i've had the hardest time listening to it..
but my love for Jasmine was so much i couldn't even say at this point..
still, i loved Teru, Kamijo, and Hizaki a lot more..
but Jasmine, i loved in a different way. right now, more than anyone..
and even before now, he meant everything to me..
which i know sounds messed up.. but i think it's my obsession i have with them..
yes, a mental problem, but one i never wanted to fix.. even to this day..
and now that Jasmine's gone, i've lost a big part of it..
i don't care if it's been over a week!! i've cried for him constantly!! i can't quit thinking about him!! i don't want you to think i'm selfish..
i'm glad you're not suffering anymore..
but your life was way too short and i don't think it's fair. you didn't derserve to die..
you made so many people happy. i'm completely heartbroken without you Jasmine..
and i just can't apologize enough..
and i again, i really hope you understand..
and forget everything else.. Jasmine... Just for you..
i'm not person to cause harm to myself nor am i one to do worse..
but it is the way i feel right now..
i can't believe i'm so down.. I can't forget about him.. Starting Sunday, Jasmine You of Versailles had passed away. He may have not been my favourite of the band, but i really did love him. and yesterday i even ended up with a slight fever because of it. but i just can't control my sad feelings about him. I'm not sure if i've posted on here about my mental problem..
nothing dangerous.. unless it ends up that way. i care too much for everything and everyone. and my music was the greatest of my obsessions. i love my bands, and i really love the people in them. i'm all about them, but i do respect them. i would never go stalking them or stuff like that..
i want them to be happy, even if it cause me to be sad. but i love them so much.. they mean the world to me. he, also, meant the world to me. and i hope he's not looking at me like this right now..
i'm sure he wouldn't want his fans to be sad..
and i'm tearing my heart to pieces over this..
and i know he meant so much to so many people. he made so many people happy. Juka said, "I hope you're okay, I'm worried about you." and this really made me cry..
Jasmine said, "I'm sorry to worry you, I'm okay." It's just so hard to live with this right now..
i never once thought that he could be the one to go next..
i've been dreading the day i heard news like this..
Jasmine, I love you so much!! and i'm sorry for crying so bad..
and i'm sorry for crying so much..
i'm sorry that i'm so sad for you..
you meant so much to me..
more than you even should..
so please forgive me Jasmine..
i would never want you to see me so hurt.. I've been crying for two days now, but i can't help it. How can something like this happen?? REST IN PEACE, JASMINE YOU. I finally finished adding captions to my Visual Kei DVD Magazine Volume 2 i uploaded on YouTube!!! that took the breathe out of me just thinking about that sentence.. I'll be sure to fix in in a flash! and visit the all new Japan Forum mentioned in the description!! and be sure to rate and comment on my videos!!! i still haven't turned my summer sleeping habits around for school..
Miku san wa cho kawaii desu yo ne?! Okay, so i meant to put captions on my Visual Kei DVD Magazine videos i uploaded on YouTube before i uploaded them..
a user commented saying SMILE was the funniest of the three.. They're talking about Sushi, the culture of Japan.. Okay, i've uploaded the Visual Kei DVD Magazine Volume 2 to YouTube!!! Himeichigo, Chariots, SMILE, Mana's Not Dead, SuG, Moi dix Mois, Mix Speaker's, Inc. and SaTaN!! okay, well, as i just found out..
check the post again... o.O?? or am i the only one this happens to? well, idk but i don't like that very much..
>.< i don't check my email very often!!! Thiturday is the new Saturday!! I just bought D'espairsRay's new album!! !